Katherine and I were in the city this evening. We went to a little mom and pop El Salvadorean restaurant my sister introduced me to. It's a bare bones place, where the tables are sticky and the air conditioning only kind of works, and it's deep in the barrio. But, oh my, is the food ever delicious! Daddy and his girls playing hide-and-seek, it doesn't get too much cuter than this. You have to turn up your computer speakers when you watch this video, because the way they count is classic! p.s. please don't judge, it was laundry day at my house...hence the state of our living room. Each summer, the elementary school I work at has "Library Night." Throughout the summer, every Thursday night, the library is open for families to come check out books for summer reading. About three years ago, we started adding a hot dog dinner to sweeten the deal, and teachers will also make desserts for the event each Thursday. 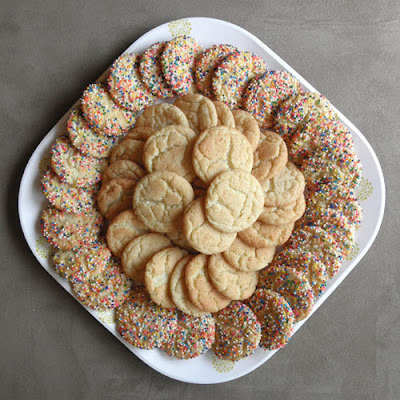 Tonight is my night to make some cookies, and I thought sickerdoodles would be delicious; and then I thought snickerdoodles with sprinkles would really please the kids (not to mention this big person who loves sprinkles on sugar cookies). They turned out GREAT. A little on the crisp side, because I don't like my snickerdoodles underbaked. I made half sprinkled and half cinnamon/sugar, just because I could. 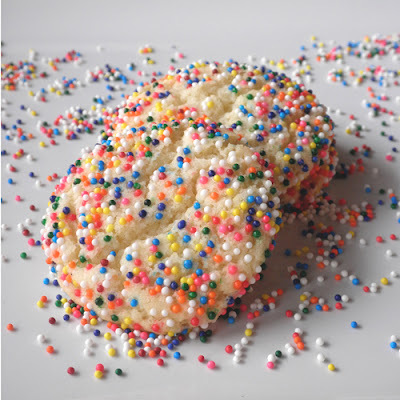 Using sprinkles for half the recipe used a whole 3 oz. bottle of nonpareils. Beat together the shortening and sugar till smooth, then add the eggs, again beating till smooth. Beat in the vanilla, cream of tartar, baking soda, and salt, then add the flour, mixing slowly till combined. (Don’t overbeat. And for the record, be sure to NEVER overbeat cookie dough.) Cover and refrigerate at least two hours. 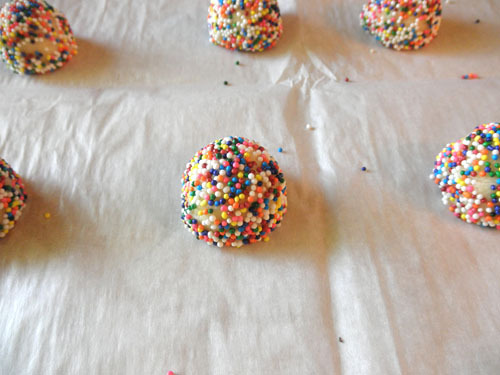 Once dough is chilled, roll tablespoon-sized balls in the nonpareils in a shallow pan or bowl. You can coat 3-5 balls at a time. Gently shake the pan/bowl to coat the dough balls with sprinkles. Place them on a parchment-lined cookie sheet, leaving about 1 ½" between them. Bake the cookies at 400°F for 10 to 11 minutes, or until puffed and browned around the edges. Remove the cookies from the oven, cool on the pan for about 3-5 minutes, and then cool them on a rack. Cookies are ready for Library Night. The real, live bag of popcorn. Okay, not live, but real. 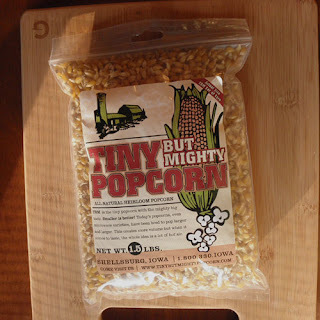 In the other post, I mentioned the Amish Country Popcorn, that is even tinier than the TBM popcorn, but like I said, this is easier to get, and it tastes just as good. Just not as tiny. Besides its charming size, this popcorn tastes great just popped in some canola oil and then lightly salted. My friend Karla uses the fine setting on her sea salt grinder, and it tastes even better. It's a nice, clean, crisp, salty taste; plus, it's a variety that has a disintegrating hull. So, after it's popped, you're not left with those strange shells that get stuck in your teeth (or tonsils in my case--eew). If you're interested in this popcorn, but don't live in around Iowa, you can order TBM popcorn online, but it's kind of pricey. If you live in the Des Moines, Iowa, area, HyVee and Dahls carry the brand in most stores, but Dahls has better prices. I got my 1.5 pound bag for $3.19 at Dahls the other day, and I've seen it at HyVee for as much as $5.89. So, here are three different recipes to go with the three different ways to enjoy this tiny popcorn. Have fun! Place oil in a heavy bottomed two quart pot with a fitted lid. Place one or two kernels of popcorn in the the oil. 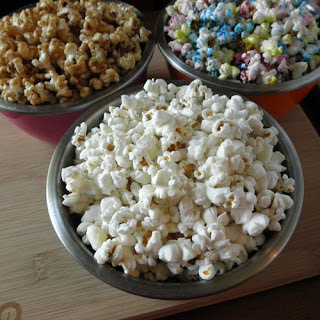 Heat oil over medium-high heat until popcorn turns a lighter, almost white color. Pour in remaining popcorn and cover with the lid. You actually don't have to shake the pot the entire time, but you can if it makes you feel better. When the popping starts to slow, then shake for sure. 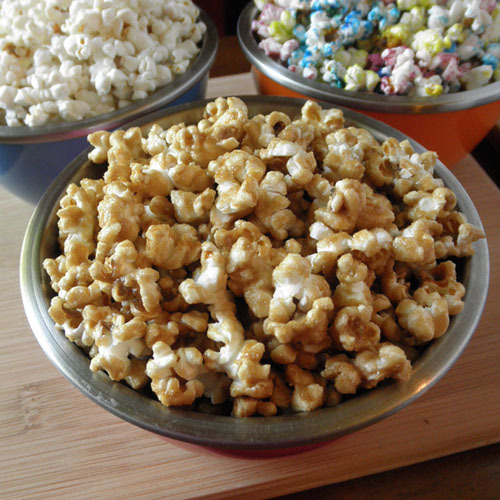 When popcorn is only popping about one per second, it's time to remove from heat, uncover, and pour into a large bowl. If you want butter, place the butter in the hot pan and swirl around until melted and pour evenly over popcorn. Toss. Salt a little at a time and taste to see if you need more. In a heavy 5-quart pot, heat the oil over medium-high heat. Add the popcorn kernels and sugar. Cover and shake until the popping is just about done. Don't leave it on for too long, or the sugar will burn and taste terrible. Pour into a metal or ceramic bowl (plastic will melt) and stir/toss until cool to the touch. Sprinkle with a little salt and stir/toss; taste and repeat until you like the level of saltiness. 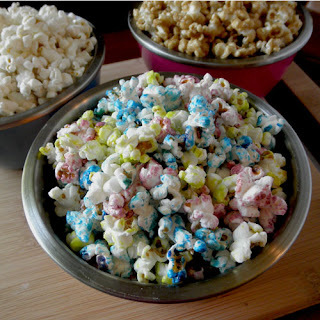 *If you want colored kettle corn, I suggest you purchase some food color gel. I like this kind because of its easy squeeze bottle. For each color I squeezed in one large drop of gel right after putting in the sugar. The water in the gel will make the oil spit, so it's best to put the sugar in first so it can absorb the gel. Once you start shaking, the color gets evenly distributed. Combine brown sugar, butter, corn syrup & salt in a medium to large microwavable dish. Microwave on high until butter is mostly melted and then stir to combine ingredients. Bring to a boil by cooking on high for about 2 minutes. Remove and add baking soda. Put naked popcorn into a huge bowl. Pour above syrup stuff over popcorn and mix thoroughly. 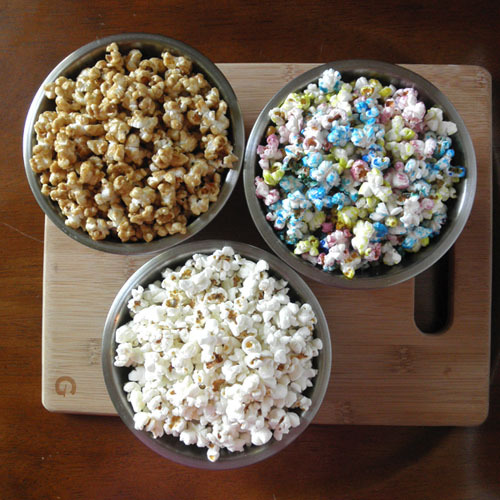 Spread popcorn onto two non-stick cookie sheets. Bake at 250° for 1 hour, stirring every 15 minutes, rotating pans between top and bottom shelves. Remove from oven; stir immediately. Stir occasionally while cooling. Store in an airtight container. We had an impromptu tennis match on the driveway this morning. Well, some tennis ball whacking, anyway. Steve pitched and the girls hit. Kate managed to connect with the ball a few times, but Rae just swung wildly. It was pretty fun! 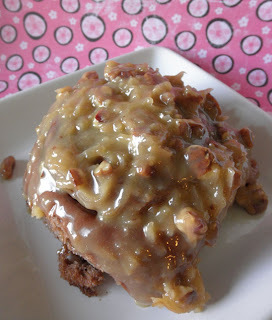 Okay, so I wasn't going to post this recipe until I won the Tones Cinnamon Roll Competition with it at the Iowa State Fair. I did enter them last summer in the Non-Traditional Cinnamon Roll class, and they went immediately to the reject table. This is what the judge said on my comment card: "These are stunning. This is an idea for a roll that I have never encountered in my life. It looks so heavy but is so light. 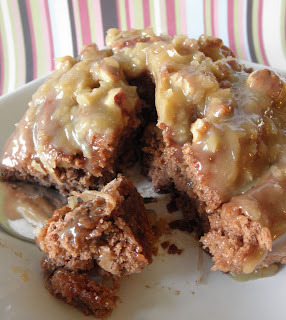 However this reminds me more of a cake than a roll." I think I literally screamed in my car when I read that comment card after the fair was over. Seriously? "more of a cake than a roll"? It's a NON-TRADITIONAL cinnamon roll, for crying out loud! I guess I'm still a little angry over it. Actually, I was at Trader Joes about a month later, and I SAW the judge there shopping alone. I was so, so tempted to go ask her what business she had judging a non-traditional cinnamon roll competition if she was unable to think outside of a box. I thought better of it, and didn't accost her. I don't want to be banned from the competition. At any rate, I don't know if I'll try entering this again next year, hoping for a better judge, but if there's any chance this woman will be on the panel, I don't think I could take it. Oh, this roll gets rave reviews from everyone who tastes it. You heard what the judge said, it's "stunning." 1. In the bowl of a standing mixer, sprinkle yeast over warm water. Allow to sit for 10 minutes, until soft and bubbly. With the paddle attachment, stir in sugar, butter, cocoa, egg & yolk, and vanilla. Mix until smooth. Switch to the dough hook attachment, and add milk and 3 cups flour. Mix & kneed on medium low speed for 8-10 minutes, until smooth and elastic, adding additional ¼ cup of flour 1 tablespoon at a time if it seems 7too sticky. 2. Place dough in a large, lightly greased bowl, turn to coat, cover with plastic wrap, and allow to rise until doubled, 1-2 hours. Meanwhile, mix brown sugar, cinnamons, and salt and set aside. Butter a 9 x 13-inch metal pan and set aside. 3. While dough rises, make the frosting. In a large saucepan, combine evaporated milk, sugar, egg yolks w/ water, butter, and vanilla. Cook over low heat, stirring constantly, until mixture is thick and reaches 180°F. Pour into a separate bowl and allow to cool. Then stir in toasted pecans and coconut. 4. Punch dough down and turn out onto a floured surface to form rolls. Roll dough out to a 16 x 20-inch rectangle. Evenly spread butter over the surface of the dough, leaving a 1 inch area of the dough free on one of the short ends. Spread sugar/cinnamon mixture over the butter lightly using your hand. Press in gently with a flat hand. Starting at the short end that has the filling, roll dough, brushing away extra flour with a dry pastry brush. Wet the end and seal by pinching gently. 5. Brush off excess flour. Using a 2-ft. length of dental floss, cut the dough into 6 equal pieces. Place in buttered pan, cover, and let rise until puffy and almost doubled, about 1 hour. 6. Preheat oven to 350°F. Bake rolls at 350°F for 25-30 minutes, or until the center of a roll registers 188-190°F on a probe thermometer. Remove from oven and allow to cool for 20 minutes before frosting. 7. Frost rolls and serve. Keep leftovers in an airtight container. I made enough at my garage sale to buy a new camera. It's a lot smaller than my old one, but it can actually do more. I'm having fun just playing around with it, seeing what it can do. And so far, I'm impressed. Here's a mini photo shoot in the front yard this morning (eye-popping jungle dresses are Granny's design). My daughter and I just returned from 11 days in the South. Seven of those days were spent with friends Gaily and Chris in rural northeastern Georgia, followed by four days in Atlanta. Pecan trees, vegetable gardens, a creek, a large rambling farm house, and a barn, are all located on my friend's ten acres of land near the small town of Ila, Georgia. Population: 328. It’s also home to many species of birds (including bob whites, cardinals, titmouse, and more), bunnies, coyotes, snakes, biting fire ants and one feral kitty named Sonny. They also keep bees at the far end of the property, and were in the process of extracting honey the day we left. I adore Georgia! It is here in my friend's cozy farmhouse kitchen where I created my very first pie, 17 years ago. 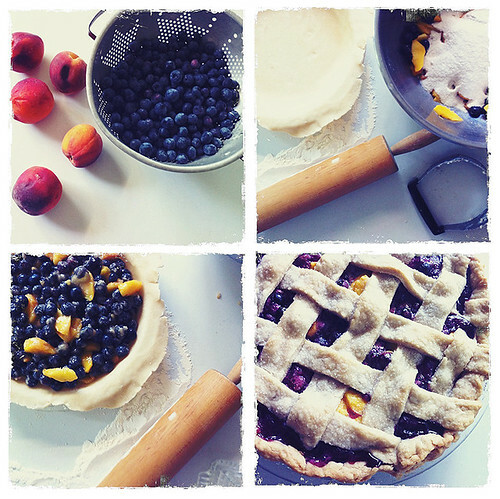 It was only fitting that I bake pie while visiting. Pie dough must be rolled out early in the morning before the hot Georgia sun heats up the kitchen. Otherwise it’ll melt right off the dish before you get it in the oven, or worse yet, fall apart before it even gets into the dish. I also made fresh basil pesto to accompany the pie. I'm so jealous that they already have basil and tomatoes to harvest. Mine aren't even planted yet! Here is our new logo - what do you think? We thought it was time to update our logo at Mairtown Kindergarten. We wanted something simple, natural, reflective of our community, but also beautiful. Jasmine, (Kiedis's mum) a graphic designer very kindly gifted her time and expertise to design the logo. We think it is perfect, and can't thank Jasmine enough. Katherine made it through 3 performances of School House Rock! Too this weekend. We all went Saturday night (Rachel sat on Grandpa's lap and never even wiggled she was so transfixed by the show!) and Robie and I went today. The show was great! Katherine was SO proud to be in it and we were SO proud of her being up on stage. It was a good experience for her. "Lolly, lolly, lolly, get your adverbs here..."
"There are ideas everywhere you look..."
"Conjunction junction, what's your function?..." All the younger kids were train cars during the song and carried posters with various nouns and conjunctions printed on them. Kate was a little embarassed to be "but" - it's an important word in the song, but no one really wants to be a but. There was a cast party after the show - ice cream sundaes in the green room. Katherine thought that was a great idea. Katherine is a seasoned actor now. She knows about scripts, roles, rehearsals, memorizing lyrics, learning dance steps, how to block a scene, what "downstage right" means, how important the stage manager is, and the thrill of a crowd watching and clapping for you. I had to explain what "break a leg" meant (and agree that it's pretty silly) but she had a great time performing. And that is the magic of theatre. On the 24th it was Tony's birthday. "It's My Daddy's Birthday" the girls kept saying. Since the movie Cars 2 came out on Tony's birthday and the girls absolutely love Cars 1, Tony thought it would be super fun to take the girls to their first Big Screen showing. Of course we had to hype it up.... The girls had to bring their Lightning McQueen and Finn McMissile plush toys with them to the movie. The whole experience was super fun...but I will say I was a bit disappointed in the sequel. The actual content of the movie did not matter to our little ones, they just wanted to see their favorite characters on the big screen and of course eat some movie popcorn. Lola is smiling with such anticipation... the video below is priceless! Ellie LOVED the popcorn and did not even wait to get back to seat before chowing down! ...the girls lasted through ALL the previews, the short film before, and about 40min of the movie before they were done. Ellie kept saying "Mom, I want to leave this movie!" Lola just kept getting up and playing with her Finn toy. After the Movie we came home to help Daddy Celebrate his birthday with Dinner, cake, and of course presents! Sara's sister Emily and her niece Claire joined us in the celebration! The girls eating the yummy cake! ....it a hard picture to make out but Ellie is getting some tickle torture from her Uncle Mark, too fun! Happy Birthday Tony...All three of your girls love you so much! Katherine is in a play this weekend. It's a community production and a "real" show with scripts, multiple scenes, lights, a set, costumes, and several weeks of rehearsals. They're doing School House Rock! Too - a cute story involving all of the old TV School House Rock songs of my childhood (Conjunction Junction, what's your function...). Kate begged to be in the play and I finally relented. She has had some long, late rehearsals but has never complained. She's learned a lot from the older kids. Katherine's part is small - she's one of a group of younger kids who are in just a few scenes. But she does not care, she's an actor. She just likes being part of a big production. If you are in the area, come see the show! It's at Southwestern College at 7:30 tonight and 2:00 Sunday. Today was the last day of swimming lessons for the girls. They have LOVED going. They have tanned nut brown and perpetually smell of chlorine and they're going to miss their daily lesson. Katherine has always been a little afraid of the water. She likes to get wet, but doesn't really want to put her face in the water and never quite trusts enough to let go and swim. But that is rapidly changing. This summer she has learned to really float, do the back stroke, get somewhere by doing the crawl stroke, jump into the pool, and venture into water deeper than she is. That is pretty amazing! She has lost a lot of her fears and gained a lot of confidence and it is so much fun to watch. She has turned in to a true swimmer. And Rachel? Well, Rachel's goal is to spend as much time as possible underwater. If she could grown gills and just be a fish, she would! She listens to her teacher and does everything she is asked, she just makes sure to put her head under at every opportunity. And her favorite thing, of course, if jumping off the side into her teacher's arms. (Or not.) She is not as scary to watch this year, as she has at least a little more respect for water and self-control. She just loves to swim! They got their tickets and are ready to go! The stations were filled with excitement and the girls we so curious! We took them to dinner downtown after our trolley ride, look at this big girl catching up on her reading. Lola is just waiting patiently for her food. So Tony has the girls convinced that Mr. Waternoose from the movie Monsters Inc. lives in the gutters, every time the girls see a grate in the street they must stop to check and see if he is there. They yell down the whole "Mr. Waternoose" Downtown San Diego has quite a few of these grates so you can imagine home many times we had to stop. The girls definitely enjoyed their second ride on the trolley, but they stated that next time they would like to ride the "Blue one" aka the Coaster. We will have to plan a ride on the Coaster this summer!